A post-sunset swimmer at Moonlight Beach in Encinitas, Calif., this month. Over the past quarter-century, Earth’s oceans have retained 60 percent more heat each year than scientists previously had thought, said Laure Resplandy, a geoscientist at Princeton University who led the startling study published Wednesday in the journal Nature. In the scientific realm, the new findings help resolve long-running doubts about the rate of the warming of the oceans before 2007, when reliable measurements from devices called “Argo floats” were put to use worldwide. Before that, differing types of temperature records — and an overall lack of them — contributed to murkiness about how quickly the oceans were heating up. The higher-than-expected amount of heat in the oceans means more heat is being retained within Earth’s climate system each year, rather than escaping into space. “We thought that we got away with not a lot of warming in both the ocean and the atmosphere for the amount of CO2 that we emitted,” said Resplandy, who published the work with experts from the Scripps Institution of Oceanography and several other institutions in the United States, China, France and Germany. Wednesday’s study also could have important policy implications. If ocean temperatures are rising more rapidly than previously calculated, that could leave nations even less time to dramatically cut the world’s emissions of carbon dioxide, in the hope of limiting global warming to the ambitious goal of 1.5 degrees Celsius (2.7 degrees Fahrenheit) above preindustrial levels by the end of this century. The world already has warmed one degree Celsius (1.8 degrees Fahrenheit) since the late 19th century. Scientists backed by the United Nations reported this month that with warming projected to steadily increase, the world faces a daunting challenge in trying to limit that warming to only another half-degree Celsius. The group found that it would take “unprecedented” action by leaders across the globe over the coming decade to even have a shot at that goal. Meanwhile, the Trump administration has continued to roll back regulations aimed at reducing carbon emissions from vehicles, coal plants and other sources and has said it intends to withdraw from the Paris climate accord. In one instance, the administration relied on an assumption that the planet will warm a disastrous seven degrees Fahrenheit, or about four degrees Celsius, by the end of the century in arguing that a proposal to ease vehicle fuel-efficiency standards would have only minor climate impacts. The new research underscores the potential consequences of global inaction. Rapidly warming oceans mean that seas will rise faster and that more heat will be delivered to critical locations that already are facing the effects of a warming climate, such as coral reefs in the tropics and the ice sheets of Greenland and Antarctica. The new research does not measure the ocean’s temperature directly. Rather, it measures the volume of gases, specifically oxygen and carbon dioxide, that have escaped the ocean in recent decades and headed into the atmosphere as it heats up. The method offered scientists a reliable indicator of ocean temperature change because it reflects a fundamental behavior of a liquid when heated. 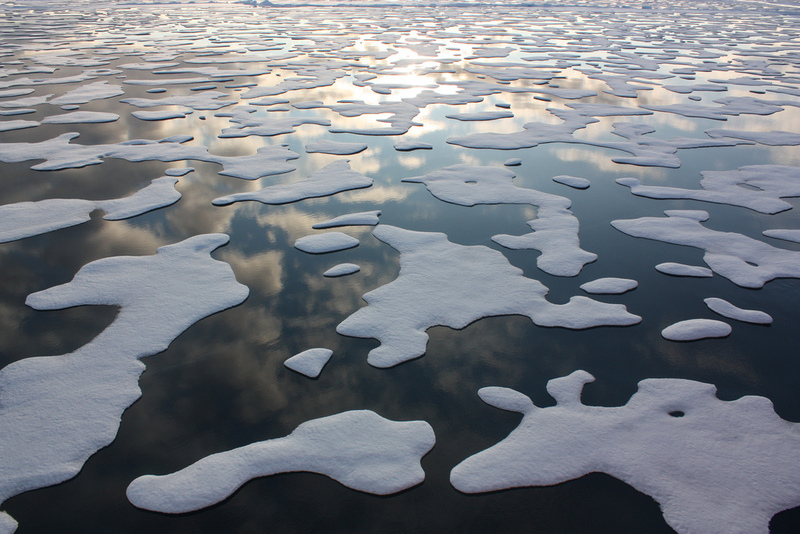 “When the ocean warms, it loses some gas to the atmosphere,” Resplandy said. This approach allowed researchers to recheck the contested history of ocean temperatures in a different and novel way. In doing so, they came up with a higher number for how much warming the oceans have experienced over time. “I feel like this is a triumph of Earth-system science. That we could get confirmation from atmospheric gases of ocean heat content is extraordinary,” said Joellen Russell, a professor and oceanographer at the University of Arizona. The report “does have implications for climate sensitivity, meaning, how warm does a certain amount of CO2 make us?” Russell said, adding that the world could have a smaller “carbon budget” than once thought. The scientists calculated that because of the increased heat already stored in the ocean, the maximum emissions that the world can produce while still avoiding a warming of two degrees Celsius (3.6 Fahrenheit) would have to be reduced by 25 percent. The U.N. panel of climate scientists said recently that global carbon emissions must be cut in half by 2030 if the world hopes to remain beneath 1.5 Celsius of warming. But Resplandy said that the evidence of faster-warming oceans “shifts the probability, making it harder to stay below the 1.5-degree temperature target." Scientists have found that ocean heat has increased at all depths since the 1960s, while surface waters also have warmed. The federal climate report projected a global increase in average sea surface temperatures of as much as nearly five degrees Fahrenheit by 2100 if emissions continue unabated, with even higher levels of warming in some U.S. coastal regions. The world’s oceans also absorb more than a quarter of the carbon dioxide emitted annually from human activities — an effect making them more acidic and threatening fragile ecosystems, federal researchers say. “The rate of acidification is unparalleled in at least the past 66 million years,” the government climate report stated. He said that if scientists have underestimated the amount of heat taken up by the oceans, “it will mean we need to go back to the drawing board” on the aggressiveness of mitigation actions the world needs to take promptly to limit future warming. Beyond the long-term implications of warmer oceans, Russell added that in the short term, even small changes in ocean temperatures can affect weather in specific places. For instance, scientists have said warmer oceans off the coast of New England have contributed to more-intense winter storms. For their expedition to Clipperton, conducted in partnership with the University of French Polynesia, the Pristine Seas team shot hundreds of hours of underwater and topside footage for a documentary film. Their scientific findings supported the creation of a marine reserve, announced at the September 2016 Our Ocean conference in Washington, D.C., that encompasses Clipperton’s territorial waters. HARP deployment locations. Green: sites with currently active recorders. Over the last several years, Google AI Perception teams have developed techniques for audio event analysis that have been applied on YouTube for non-speech captions, video categorizations, and indexing. Furthermore, we have published the AudioSet evaluation set and open-sourced some model code in order to further spur research in the community. Recently, we’ve become increasingly aware that many conservation organizations were collecting large quantities of acoustic data, and wondered whether it might be possible to apply these same technologies to that data in order to assist wildlife monitoring and conservation. As part of our AI for Social Good program, and in partnership with the Pacific Islands Fisheries Science Center of the U.S.
National Oceanic and Atmospheric Administration (NOAA), we developed algorithms to identify humpback whale calls in 15 years of underwater recordings from a number of locations in the Pacific. The results of this research provide new and important information about humpback whale presence, seasonality, daily calling behavior, and population structure. 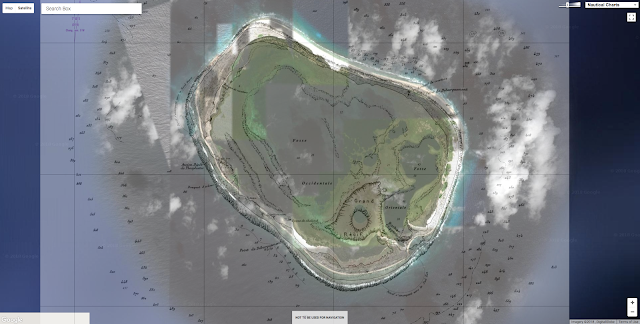 This is especially important in remote, uninhabited islands, about which scientists have had no information until now. Additionally, because the dataset spans a large period of time, knowing when and where humpback whales are calling will provide information on whether or not the animals have changed their distribution over the years, especially in relation to increasing human ocean activity. That information will be a key ingredient for effective mitigation of anthropogenic impacts on humpback whales. Passive acoustic monitoring is the process of listening to marine mammals with underwater microphones called hydrophones, which can be used to record signals so that detection, classification, and localization tasks can be done offline. This has some advantages over ship-based visual surveys, including the ability to detect submerged animals, longer detection ranges and longer monitoring periods. Since 2005, NOAA has collected recordings from ocean-bottom hydrophones at 12 sites in the Pacific Island region, a winter breeding and calving destination for certain populations of humpback whales. The data was recorded on devices called high-frequency acoustic recording packages, or HARPs (Wiggins and Hildebrand, 2007; full text PDF). In total, NOAA provided about 15 years of audio, or 9.2 terabytes after decimation from 200 kHz to 10kHz. From a research perspective, identifying species of interest in such large volumes of data is an important first stage that provides input for higher-level population abundance, behavioral or oceanographic analyses. 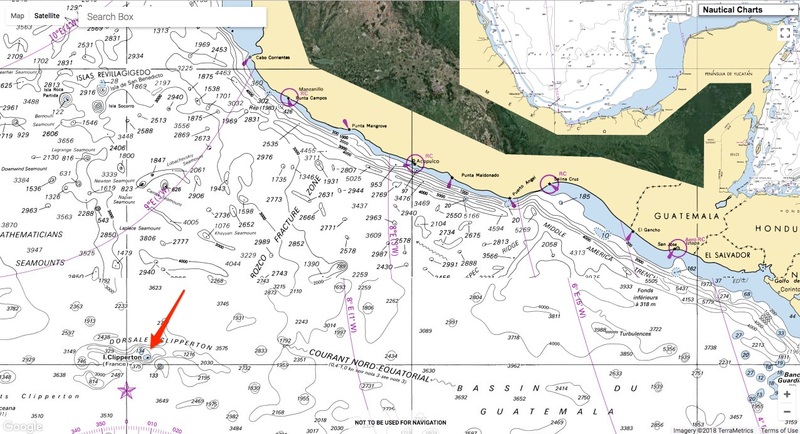 However, manually marking humpback whale calls, even with the aid of currently available computer-assisted methods, is extremely time-consuming. Example spectrograms of audio events found in the dataset, with time on the x-axis and frequency on the y-axis. This is a good representation for an image classifier, whose goal is to discriminate, because the different spectra (frequency decompositions) and time variations thereof (which are characteristic of distinct sound types) are represented in the spectrogram as visually dissimilar patterns. For the image model itself, we used ResNet-50, a convolutional neural network architecture typically used for image classification that has shown success at classifying non-speech audio. The process of going from waveform to spectrogram involves choices of parameters and gain-scaling functions. Common default choices (one of which was logarithmic compression) were a good starting point, but some domain-specific tuning was needed to optimize the detection of whale calls. Humpback vocalizations are varied, but sustained, frequency-modulated, tonal units occur frequently in time. If the frequency didn't vary at all, a tonal unit would appear in the spectrogram as a horizontal bar. Since the calls are frequency-modulated, we actually see arcs instead of bars, but parts of the arcs are close to horizontal. A challenge particular to this dataset was narrow-band noise, most often caused by nearby boats and the equipment itself. 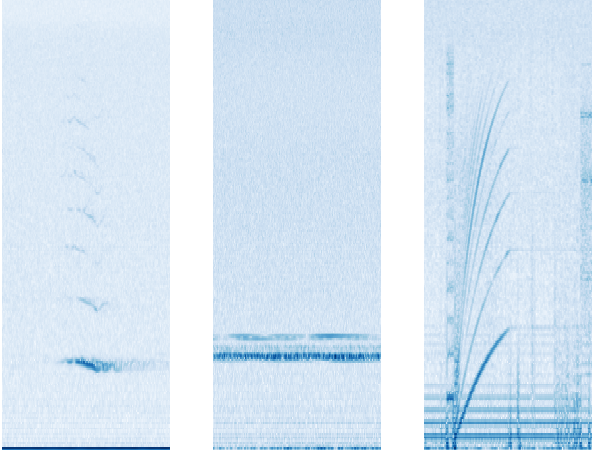 In a spectrogram it appears as horizontal lines, and early versions of the model would confuse it with humpback calls. This motivated us to try per-channel energy normalization (PCEN), which allows the suppression of stationary, narrow-band noise. This proved to be critical, providing a 24% reduction in error rate of whale call detection. beginning at 0:06 in the above recording. Bottom: log of squared magnitude. Aside from PCEN, averaging predictions over a longer period of time led to much better precision. This same effect happens for general audio event detection, but for humpback calls the increase in precision was surprisingly large. 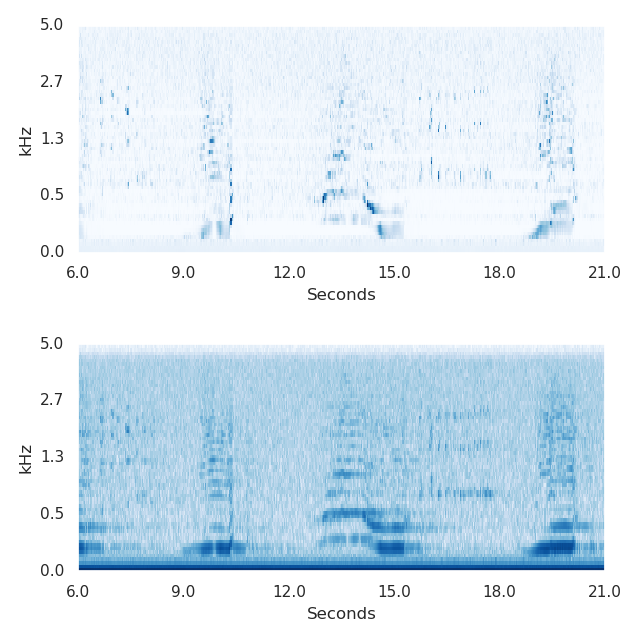 A likely explanation is that the vocalizations in our dataset are mainly in the context of whale song, a structured sequence of units than can last over 20 minutes. At the end of one unit in a song, there is a good chance another unit begins within two seconds. The input to the image model covers a short time window, but because the song is so long, model outputs from more distant time windows give extra information useful for making the correct prediction for the current time window. 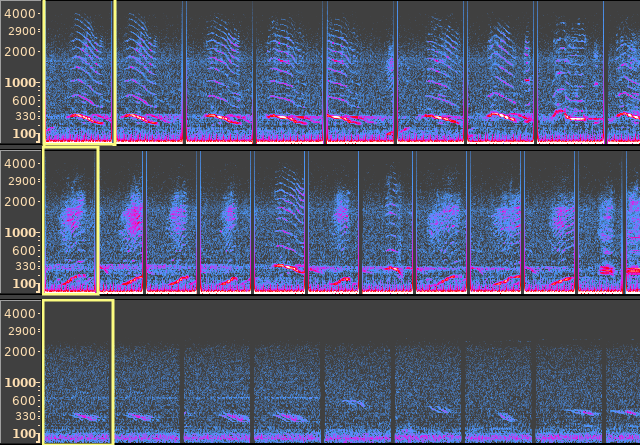 Overall, evaluating on our test set of 75-second audio clips, the model identifies whether a clip contains humpback calls at over 90% precision and 90% recall. However, one should interpret these results with care; training and test data come from similar equipment and environmental conditions. That said, preliminary checks against some non-NOAA sources look promising. A female humpback whale swims with a male (below) in Maui, Hawaii. Long thought silent, females may have their own, low-frequency songs. 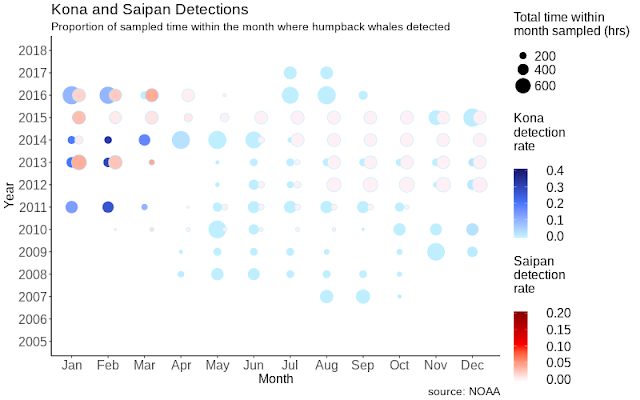 A different way to approach the question, "Where are all the humpback sounds in this data? ", is to start with several examples of humpback sound and, for each of these, find more in the dataset that are similar to that example. The definition of similar here can be learned by the same ResNet we used when this was framed as a supervised problem. There, we used the labels to learn a classifier on top of the ResNet output. Here, we encourage a pair of ResNet output vectors to be close in Euclidean distance when the corresponding audio examples are close in time. With that distance function, we can retrieve many more examples of audio similar to a given one. In the future, this may be useful input for a classifier that distinguishes different humpback unit types from each other. To learn the distance function, we used a method described in "Unsupervised Learning of Semantic Audio Representations", based on the idea that closeness in time is related to closeness in meaning. It randomly samples triplets, where each triplet is defined to consist of an anchor, a positive, and a negative. The positive and the anchor are sampled so that they start around the same time. An example of a triplet in our application would be a humpback unit (anchor), a probable repeat of the same unit by the same whale (positive) and background noise from some other month (negative). Passing the 3 samples through the ResNet (with tied weights) represents them as 3 vectors. Minimizing a loss that forces the anchor-negative distance to exceed the anchor-positive distance by a margin learns a distance function faithful to semantic similarity. Principal component analysis (PCA) on a sample of labeled points lets us visualize the results. Separation between humpback and non-humpback is apparent. Explore for yourself using the TensorFlow Embedding Projector. Try changing Color by to each of class_label and site. Also, try changing PCA to t-SNE in the projector for a visualization that prioritizes preserving relative distances rather than sample variance. A sample of 5000 data points in the unsupervised representation. Given individual "query" units, we retrieved the nearest neighbors in the entire corpus using Euclidean distance between embedding vectors. In some cases we found hundreds more instances of the same unit with good precision. We intend to use these in the future to build a training set for a classifier that discriminates between song units. We could also use them to expand the training set used for learning a humpback detector. We plotted summaries of the model output grouped by time and location. Not all sites had deployments in all years. Duty cycling (example: 5 minutes on, 15 minutes off) allows longer deployments on limited battery power, but the schedule can vary. The apparent seasonal variation is consistent with a known pattern in which humpback populations spend summers feeding near Alaska and then migrate to the vicinity of the Hawaiian Islands to breed and give birth. This is a nice sanity check for the model. We hope the predictions for the full dataset will equip experts at NOAA to reach deeper insights into the status of these populations and into the degree of any anthropogenic impacts on them. We also hope this is just one of the first few in a series of successes as Google works to accelerate the application of machine learning to the world's biggest humanitarian and environmental challenges. To find out how this project was started, read the NOAA Fisheries blog post by Research Oceanographer Ann Allen. National Geographic : Mysterious New Humpback Whale "Song" Detected? Dp world london gateway, a container terminal on the Thames estuary, is Britain’s fastest-growing port. The borough of Thurrock, where the port is situated, has the country’s third-worst levels of air pollution, in part because of fumes spewed out by ships in the port. Upriver, in London, the International Maritime Organisation (imo), the United Nations agency for shipping, began a meeting on October 22nd aimed at taking action against air pollution. But new rules to make ships cleaner will impose crippling costs on the industry while worsening global warming. 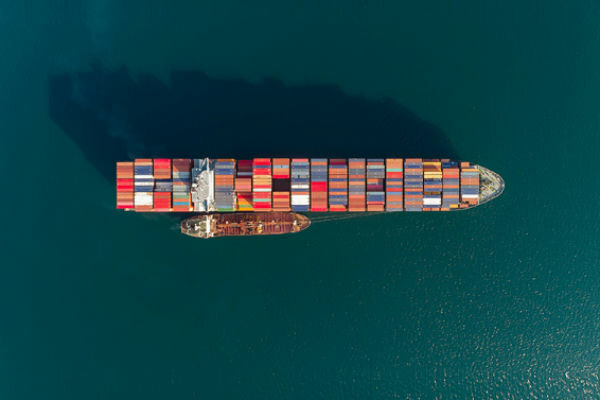 The imo will cut emissions of sulphur either by reducing its content in marine fuel from 3.5% to 0.5% from 2020 or by requiring ships to remove it from exhaust fumes. Sulphur from ships causes acid rain and air pollution, which contributes to between 212,000 and 595,000 premature deaths a year and 14m cases of childhood asthma, according to research published in Nature Communications in February. as an alternative means to meet the sulphur limit requirement. Shipowners can meet the rules by installing “scrubbers”, but these are expensive. Only around 2,000 of 90,000 commercial vessels on the world’s seas will have them by the deadline. And dealing with sulphur has other ill-effects, points out Paddy Rodgers of Euronav, an oil-tanker firm. 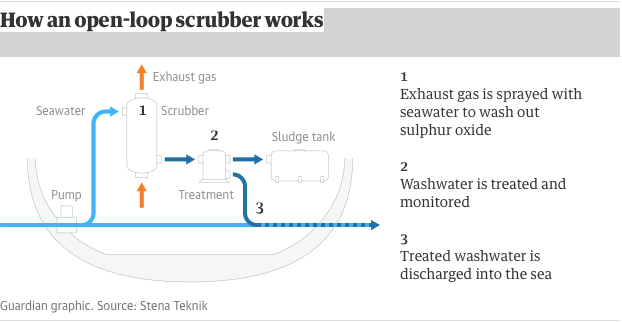 The most popular system washes sulphur out of engine fumes with seawater, which is then chucked overboard. The wastewater kills marine wildlife and causes cancer in humans, according to some research. 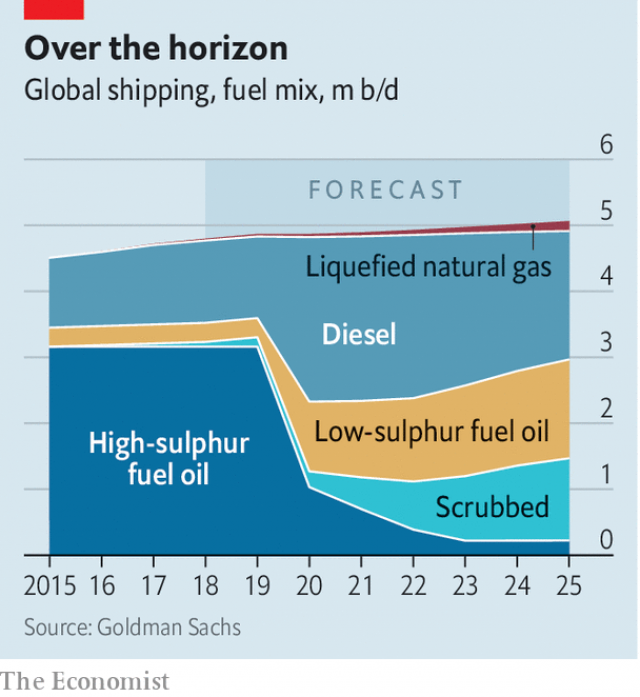 Most shipowners will switch to pricier low-sulphur fuels. But if all ships did so in 2020, demand for them would double (see chart) and the industry’s fuel bill would rise by $60bn, roughly the entire sum spent in 2016, say analysts at Wood Mackenzie, a research firm. It would also have a dramatic impact on aviation and road transport. Ships run on a heavy residue that remains after petrol, diesel and other lighter hydrocarbons are extracted from crude oil in refining. Competition for lighter fuel that clean ships require could raise the price of diesel for lorries by 50% and for jet fuel by 30-40% in 2020, reckons Philip Verleger, an energy economist. The resulting spike in global transport costs, he says, would hit world trade and wipe a staggering 3% off America’s gdp and 1.5% off the whole world’s in 2020. Big shipping lines such as Denmark’s Maersk, which can afford scrubbers or pricier fuels, support the changes. Smaller firms could be forced to scrap older ships, says Basil Karatzas, a consultant. Less capacity will mean higher rates for the rest. Worse still is the effect of the new rules on global warming. The Intergovernmental Panel on Climate Change, a un-backed body, says sulphur emissions have a net cooling effect because they scatter sunlight in the atmosphere. Sulphur also helps to form and thicken clouds that reflect sunlight away from the Earth. Some studies find that by burning heavy marine fuel the industry is slowing global warming, as the cooling effects of sulphur emissions outweigh the warming caused by those of carbon dioxide. Scientists at the Centre for International Climate and Environmental Research in Oslo calculate that shipping in net terms reduced man-made warming by 7% in 2000. The imo’s new rules will undo much of this effect. The paper in Nature Communications found that the use of lower-sulphur fuels after 2020 will reduce the cooling effect from shipping by around 80%. The imo does not accept that this might kill more people in the longer term than the number who succumb each year to air pollution. “This is the imo's biggest impact in its 60-year history,” beams Kitack Lim, the organisation’s secretary-general. Alas, for efforts to combat climate change, it is an impact of the wrong sort. A community effort involving thousands of volunteers keeps the Isle of Man’s beaches plastic-free. In just 10 years, the Isle of Man has rid its beaches of plastic and earned Unesco status as a world leader in ocean protection. So how did it do it? Standing on a windswept beach on the north-west coast of the Isle of Man, Bill Dale looked out on to plastic bottles, cartons and packaging forming a thick carpet covering the shingle. It was 2007, the global plastic binge was already well under way, but the millions of tonnes of waste seeping into the oceans as a consequence had not reached the public consciousness. It took six weekends, working long hours, to collect all the plastic litter. “We shifted 30,000 plastic bottles and large pieces of plastic,” said Dale. “You would pick one piece up, and underneath was another and another in layers. Today, as Dale stands outside an Edwardian summerhouse in the west of the island at Niarbyl bay, he believes Manx beaches are the cleanest in Europe. But the regular sweeps of the 100-mile coastline, conducted by his charity Beach Buddies, are just one facet of the island’s approach to ocean protection that makes it a global leader. In the charity’s visitors’ book, alongside comments from schoolchildren, teachers and parents, there is a signature that stands out: that of Dr Han Qunli, a senior figure within the United Nations Educational, Scientific and Cultural Organisation (Unesco). 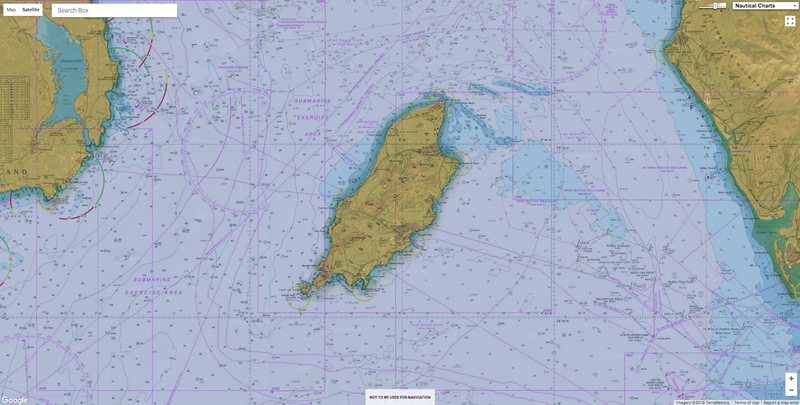 It was after his visit that the Isle of Man joined the likes of Mauritius, Menorca, Jeju in South Korea and Noosa in Australia in being singled out for a commitment to protecting and enhancing the coastal environment and biodiversity. The island’s determination to protect the coastal environment from the multiple threats of plastic pollution, climate change and overfishing has earned it the status of a Unesco biosphere region, designated because it is an outstanding example of a place where people and nature work in harmony. It is the only entire island jurisdiction to be granted the status. One indication of the islanders’ commitment to a better marine environment is the numbers that turn out for Beach Buddies. It has attracted 10,000 volunteers over the years – 12% of the Manx population. Dale said: “We have kids who come with their schools to do a beach clean, then tell their parents: ‘Dad, I want to go and do a beach clean on Saturday,’ and they bring their parents here. For marine biologist Dr Fiona Gell, who grew up on the Isle of Man, the grim reality of what is happening to the world’s oceans is all too familiar. She has spent her life studying the damage being done to the sea’s flora and fauna, and has seen first-hand the devastation that means just 13% of the world’s oceans are untouched by the impact of humanity’s footprint. Now a marine scientist at the Department for Environment, Food and Agriculture in the Isle of Man government, she heralds the steps being taken on the island as proof that all is not entirely lost. 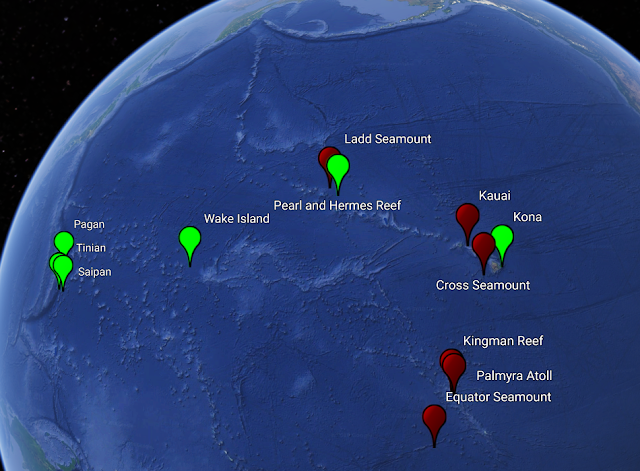 In 2011, there were just two protected marine areas in the seas off the island. But in the past seven years Gell and her team have been instrumental in throwing a protective ring around the island, increasing the number of marine protected areas to 10, which cover 50% of the inshore waters. 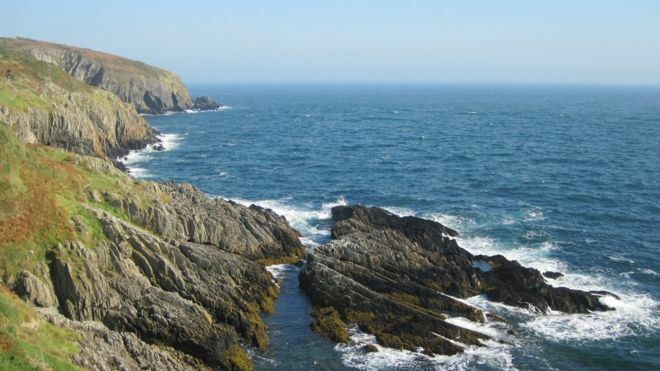 From the Calf of Man, a tiny island off the south coast where seals sunbathe on the rocks and basking sharks swim in the summer, to Ramsey Bay in the north, these marine nature reserves restrict trawling and dredging by fishermen and other damaging activities, in order to protect sealife habitats. Looking out over Ramsey Bay, which in 2011 became a marine nature reserve covering 94 sq km, Gell points out the location of seagrass beds, horse mussel reefs and maerl beds that are once again thriving. “Seagrass has declined globally in a really scary way, particularly in the UK, since the 1920s,” said Gell. “It looks like a green meadow under the sea and has a really high level of carbon storage. The Calf of Man, a small island on the Isle of Man’s south west coast, where seals sunbathe on the rocks and basking sharks swim. Each marine feature being protected and enhanced by the reserve creates diverse habitats that allow scallops, juvenile cod, lobster and other fish to thrive. 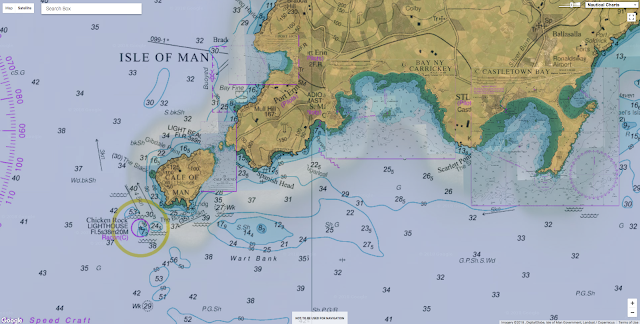 And while in many areas the fishing industry finds itself at loggerheads with environmentalists, fishing businesses on the Isle of Man – which fish for king and queen scallops, brown crab, lobster and whelk – have been involved in drawing up the protective marine belt around the island, even if some had to be heavily persuaded at first of the case for the protection zone. Dr David Beard, chief executive of the Manx Fish Producers Organisation, is also a marine biologist. “Back in 2009, Ramsey Bay had been overfished, there was very little stock left in there and the industry volunteered that area to be closed for a period of time,” he said. The bay encompasses one of the most restricted fishing areas in the coastal waters, where dredging or trawling for scallops is banned throughout the year, except for two weeks before Christmas when up to 30 boats are allowed to go out. Each year the fishermen carry out a stock survey, so by the time they are allowed to fish they know the location of the highest quantities of scallops. “They get the highest value for the least impact,” said Beard. “It is a very low-carbon action because they know where to go and they are allowed to trawl for 20 minutes maximum, and it means there is less impact on the seabed. Gell has been instrumental in trying to bring the public and fishing industry along with the conservation efforts. “We are trying not to impose from the top,” she said. 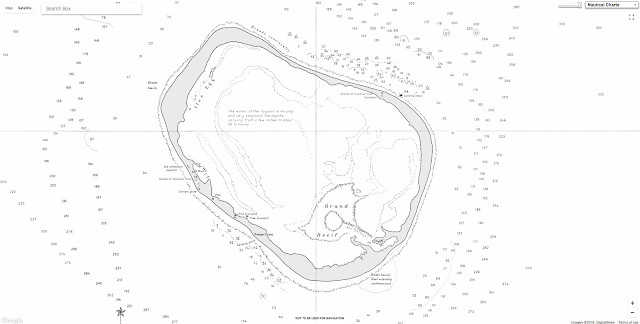 “Each marine protected area comes from a lot of engagement with the local people. 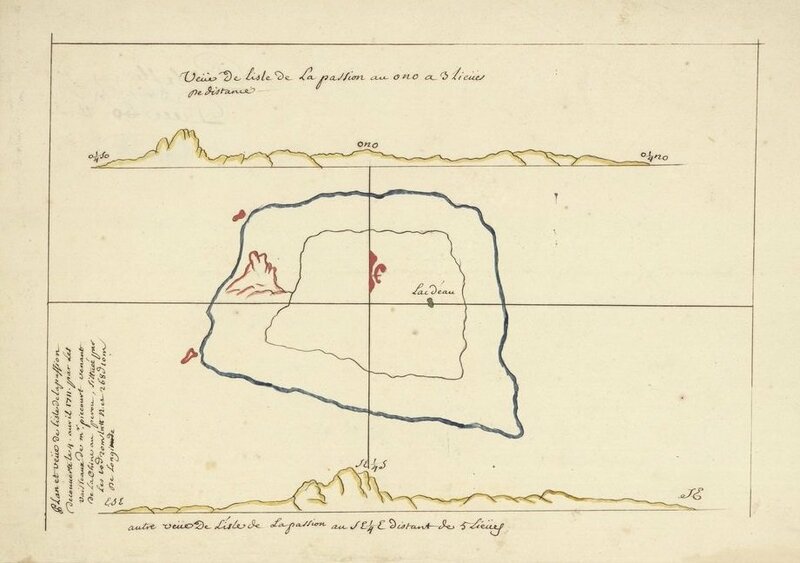 We go out all over the island to villages and towns and hold stakeholder meetings, with maps to discuss why an area needs to be protected, and to involve people and bring them onboard. It is a slow process but when I look back to 2008 and see what we have achieved I think it shows that people working together in communities can make a difference. As one of 52 Unesco island and coastal biosphere areas, the Isle of Man is focusing now with partners in Menorca, the Maldives, the Philippines and other islands on eliminating single-use plastic from their shores. If that eventually puts Bill Dale out of a job, he could not be happier. Isle of Man today : Gas extraction from Manx seas could be good for the Isle of Man's bank balance - but will it do environmental damage? It's 50 years since Sir Robin Knox-Johnston sailed non-stop around the world. 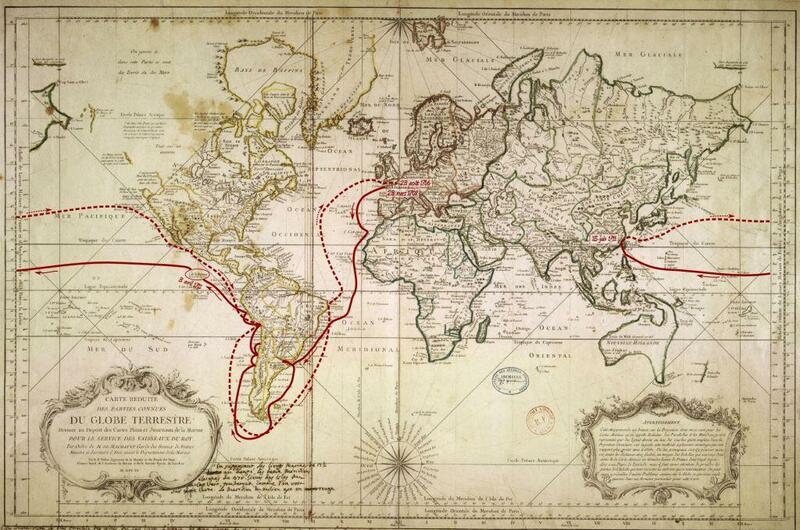 To mark this unique anniversary, Sir Robin talks to Neil Sackley about his epic voyage and why he did it.